In the heart of Los Angeles, halfway between the ocean and downtown, the Los Angeles County Museum of Art (LACMA) displays over 100,000 objects dating from ancient times to the present. The seven-building complex - which represents the largest art museum in the western United States - is undergoing a 10-year expansion and renovation dubbed "Transformation." Phase 1 of the project, which is being directed by Pritzker Award-winning architect Renzo Piano, was unveiled in early 2008. 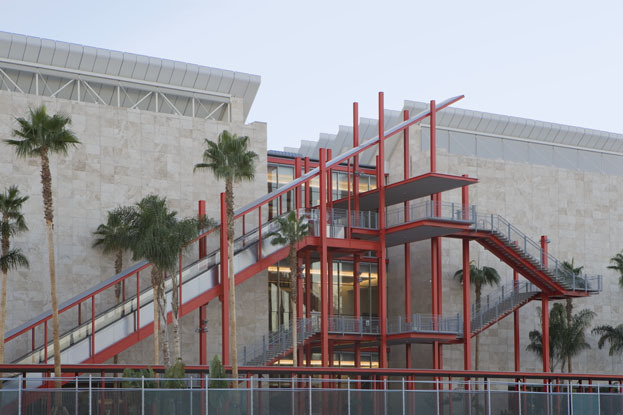 It introduces the long-awaited Broad Contemporary Art Museum (BCAM), 60,000 square feet of contemporary gallery space on three floors, along with an open-air pavilion. 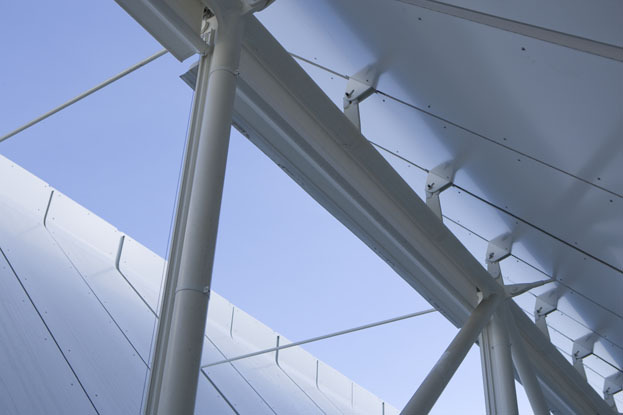 Designed by Piano in partnership with executive architect Gensler, the BCAM structure features several distinctive design and functional elements. 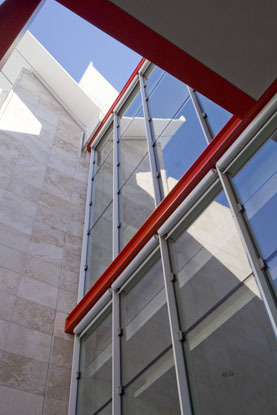 The most obvious and distinctive is a sawtooth profile at the top of the structure, which provides a unique daylighting solution and, essentially, incorporates a shading system by Hunter Douglas Contract Window Coverings to protect the artwork from sun damage. 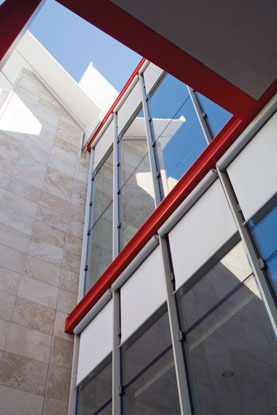 In addition, the exterior facade of Italian travertine serves to unite the various buildings on the campus. Intricate details such as the vivid red "spider" escalator climbing the north wall, and the rotation of commissioned artworks adorning the Wilshire Boulevard elevation, enhance the facade. Piano created an interior plan with galleries on all three levels, so that visitors could experience a vertical gradient of conditions. He wanted daylight to illuminate the top galleries, but merely to provide orientation on lower levels. This created the challenge of using as much natural light as possible for optimal viewing, while protecting invaluable collections from exposure to direct sunlight. 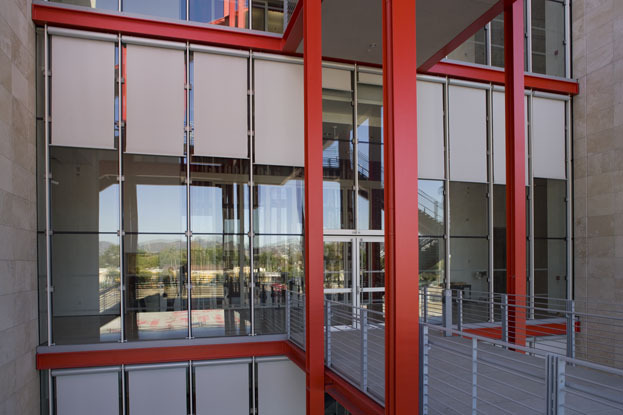 To meet the project requirements, Hunter Douglas Contract developed a system of 160 exterior motorized tension roller shades that they fitted to metal sunshades extending from the angular spires. 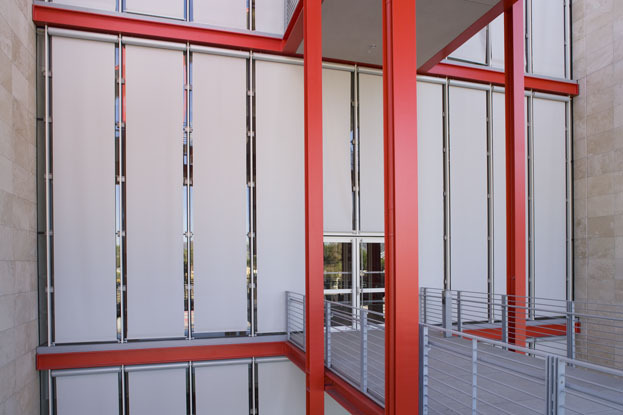 The vertical shades were positioned on the north side of each metal sunshade panel. 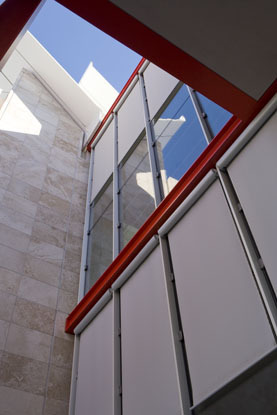 When deployed, they control the amount of light penetrating through to the gallery space below. 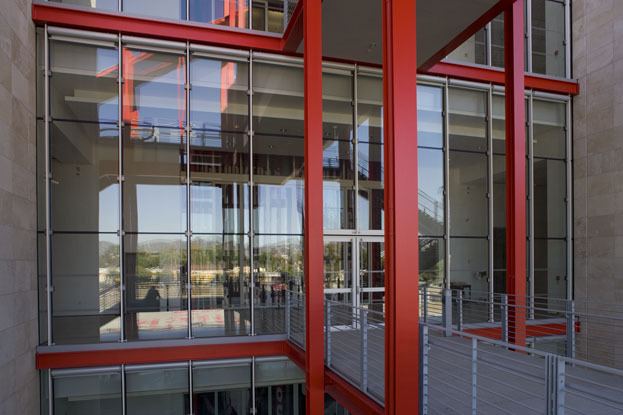 A custom hardware headbox was designed to hold the motor and wires in one neat location, rendering a view clean of wires from the 3rd floor gallery up through the glass ceilings. The 216 motorized shades connect to a custom Solarware™control system. Exterior sensors monitor brightness and wind levels, telling the system to retract shades when weather is favorable. The control system also allows the museum to program the opening and closing of the shades for different times during the day, managing the amount of light entering the building at any time. Hunter Douglas Contract louvers shield south-facing glazing on the top two levels to protect collections from UV damage, but their absence on the first-floor connects the visitor back to the site and city with a sense of openness. 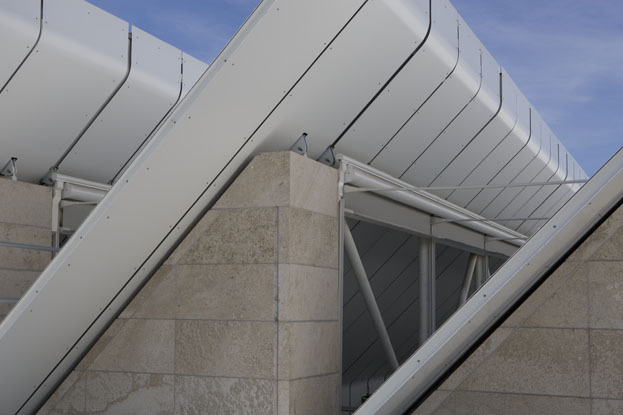 Both the roof and facade shades are equipped with durable fabric and hardware specially developed by Hunter Douglas Contract to withstand weather extremes. BCAM's inaugural installation includes expansive spaces devoted to the art of Richard Serra, Barbara Kruger, John Baldessari, Ed Ruscha, Cindy Sherman, Jean-Michel Basquiat, Damien Hirst, Chris Burden, Robert Rauschenberg, Jasper Johns, and many more. The upcoming second phase of LACMA's Transformation builds upon the unification of the museum's campus.